Prime Minister Shinzo Abe’s snap election gamble has paid off. The incumbent’s Liberal Democratic Party coalition gained a supermajority in the lower house, and Abe is now expected to remain prime minister for the next several years. The victory will in all likelihood allow him to preside over the 2020 Tokyo Olympics and become the longest-serving head of government in postwar Japan. The most indelible stamp Abe may leave could be on Japan’s constitution. The prime minister has argued for changing Article 9, the famous “no war” clause, to give explicit legal status to Japan’s Self-Defense Force (SDF). But with a crisis brewing with North Korea, a recently energized leader in China, and an impending visit to Asia by an unpredictable U.S. president, Abe will need to carefully balance his desire for constitutional revision with his foreign policy priorities. The lack of a strong opposition leader undoubtedly helped Abe and his coalition return to power. The Democratic Party dissolved after years of struggling to restore voter confidence in its ability to offer an alternative to Abe’s conservatives. In its place, two parties emerged this election. The Party of Hope, led by Tokyo Governor Yuriko Koike, presented a conservative alternative to the LDP, with a realist take on Japan’s defense needs and a forward-leaning position on constitutional revision. The Constitutional Democratic Party, led by former Chief Cabinet Secretary Yukio Edano, sees Japan’s security as best protected by the current constitution and by restraint in the country’s military ambitions. 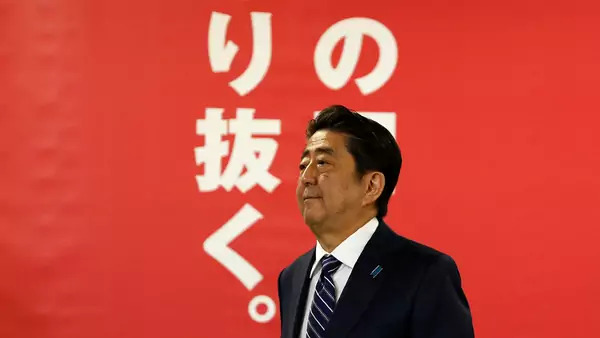 Few expected these new parties to take on the much larger and more seasoned LDP in their first election, and there seems little reason to suppose that they will be in a position to unseat Abe and his coalition government in the foreseeable future. The question will be whether they can form larger policy coalitions in the legislature and, in particular, how their positions on the constitution will shape the national debate over its revision. No conversation in postwar Japanese politics will be of greater import than upcoming deliberations over whether, and how, to amend the 1947 constitution. The debate, which is now at the forefront of Japan’s domestic politics, reflects longstanding differences over Japanese identity and history. Abe has taken issue with the origins of the document, claiming it was imposed by occupying U.S. authorities and does not reflect Japanese aspirations. Others claim that the constitution’s restructuring of political power, including a diminished role for the military, is the foundation of Japan’s postwar democracy. Despite Abe’s landslide victory, it is unclear whether he will be able to push through constitutional reforms. A large majority of legislators in Japan’s lower house would like to see revisions, according to an election-day survey conducted by Asahi Shimbun, but they do not all share Abe’s ideas about what they should be. Moreover, the Japanese electorate must approve any revisions in a national referendum, and most voters remain opposed to the idea. Indeed, in the election’s aftermath, Abe stepped back from trying to amend the constitution by 2020, saying he wanted to take the time needed to ensure that the largest number of Japanese possible support revision. Abe’s thinking on when to propose constitutional revisions could also be shaped by various foreign policy challenges. Abe will need to work hard to defend Japanese interests abroad in the coming years. While his strategic vision for Japan seems set, the global security context is changing rapidly. Several critical relationships will call for his full attention. The first and most obvious is Japan’s relationship with the United States. A new U.S. president makes for a degree of uncertainty for Tokyo, just as it has for other allies and partners across Asia. Despite Abe’s good relationship with President Donald J. Trump, many factors could derail the U.S.-Japan alliance. Trump could get bogged down in politics at home, making it harder for him to exercise leadership in Asia. Another priority for Abe is Japan’s relationship with China, which just held its Nineteenth Party Congress. A stronger President Xi Jinping could be more assertive toward China’s neighbors. This could bring more pressure on Japan’s defenses in the East China Sea, as well as new concerns about the People’s Liberation Army’s presence across the Indo-Pacific. Equally important for Abe will be knowing how the Trump administration plans to shape its relationship with Beijing. Already, rumors are beginning to suggest a confrontation between China and the United States over trade. Abe will be of two minds about this. He will want Trump to stand up to Chinese behavior that contradicts international norms and rules, but, at the same time, he will encourage the United States to play the long game in Asia and prioritize stability. A trade war or any escalation in military tensions between the United States and China would disrupt all of Asia. Finally, Abe will need to deepen Japan’s ties with like-minded states if he wants to build the foundation of collective action in Asia. The Japan-Australia strategic partnership has been developing quickly, as has Tokyo and New Delhi’s shared interest in furthering maritime cooperation. Abe will undoubtedly want to continue helping the Philippines and Vietnam improve their capacities for maritime defense and hope to strengthen ties with others who share concerns about maritime stability in the Asia Pacific, such as Indonesia and Malaysia. Expect too that Abe will continue his effort to partner with the United Kingdom and France in Asian security. As members of the UN Security Council, both have demonstrated support for Japan as it confronts a belligerent North Korea and shown a deep interest in broader strategic cooperation. Any changes to Article 9’s constraints on Japan’s military will have significant reverberations in the Asia-Pacific region and beyond. First and foremost, China and South Korea will not see it as a sign of Japanese concerns about its future security, but rather as evidence that Abe is taking Japan backwards. For its neighbors, any attempt to revamp the status quo with regard to Article 9 will be viewed as opening the door to an expansionist Japan. Constitutional changes will also draw a reaction from Washington. Trump has made a point of telling U.S. allies that they must do more for their own defenses, and he may misconstrue revision as a sign that Japan is willing to remove all constraints on its military. The Abe cabinet may have difficulty managing U.S. expectations. Around the world, Abe has come to be seen as one of the world’s steadiest leaders in a time of widespread volatility. Within Japan, he will be under scrutiny to make sure that he represents the interests and values of all Japanese. Thus, he will likely tread carefully as he attempts to assert a confident and resolute Japan. The debate over constitutional revision belongs to the Japanese people, but the Japanese government would be wise to develop a strategy for avoiding unnecessary international backlash. As Japan moves forward, the government can ensure the process is transparent by providing information in multiple languages on the deliberations in the Diet, the legal provisions for a national referendum, and the positions of each party. Japan’s neighbors and, indeed, much of the world will be watching carefully as the Japanese people debate how to put their own imprimatur on a document crafted to demilitarize and democratize their society. In today’s Asia, Japan continues to be a model of democratic transformation and technological advancement. Ultimately, the Japanese people’s decision on their constitution will shape generations to come, not only in Japan but potentially across the Asia Pacific.